Though it's officially an industrial city, Jamshedpur will surprise you with its natural bounty. 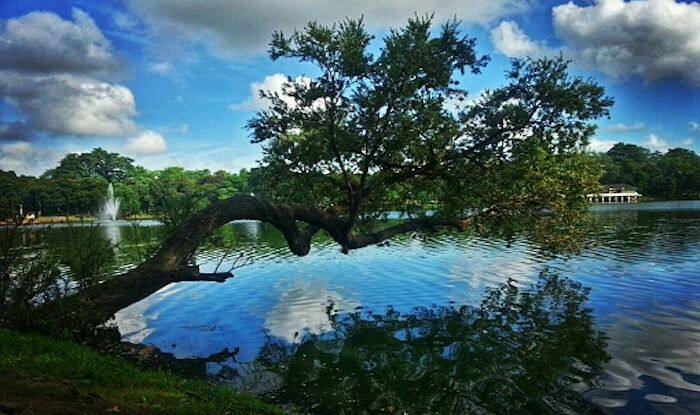 Despite being labelled as India’s first industrial city, Jamshedpur is surrounded by tons of natural beauty. Located at the confluence of Kharkai and Subarnarekha rivers, the city is home to national parks, serene lakes, scenic picnic spots and stunning flora and fauna. A trip to Jamshedpur is incomplete without visiting the Jubilee Park, situated right at the heart of the city. Spread across 238 acres of land, this park was a gift by the Tata Steel Plant to its citizens in its Golden Jubilee Year. The Mughal Garden aka Rose Garden, deserves special mention because it displays more than a thousand varieties of roses of all colours and sizes. Other prominent attractions within the park are the Jubilee Lake (Jayanti Sarovar), Jubilee Nicco Amusement Park, Foliage Park, Tata Steel Zoological Park and Smriti Udyan. You must opt for a safari or a nature trail at the Tata Steel Zoological Park. Resident species such as tigers and leopards roam around freely inside this park. If you’re particularly interested in elephants though, head to Dalma Wildlife Sanctuary in the north of the city. The best time to spot them here is in May and June. Also known as ‘Paradise of Elephants’, the park is located at a height of 3,000 feet above sea level surrounded by the majestic Dalma Hills. Apart from elephants, you can also spot rare and endangered wildlife species such as tigers, leopards, sloth bears, barking deers and porcupines. Spend an evening at Dimna Lake. The drive to the lake is as scenic as the waterbody itself. Situated right at the foot of Dalma Hills, boating on this lake is nothing short of spectacular especially during sunset. The street food is quite popular here, you must try jhal mudi and litti chokha around Jubilee Park, Sakchi and Bistupur. The nearest airport from Jamshedpur is in Ranchi, about 150km away.